This is a 2012 vintage I had been hanging onto for awhile. Rusty brown color and a still meaningful beige head. Nose is grapeskin, dark fruit, molasses, and smoked sausage. The flavor is similar and still very lively on the tongue with a thick, coating texture. There is a burned and roasted note that follows in the aftertaste. This has aged pretty well and I would look for it again. Poured from a 12 oz bottle bought in Seattle. L - Dark gold to light brown color, but murky. Very little foam or lacing, but there is an irregular, ragged sheet of bubbles partially covering the surface. S - Rich, malty aromas, as expected. There are raisins, prunes and molasses. No hops stand out. Low, sweet alcohol along with some fruity yeast character. T - Sweet malt with molasses, gingerbread and prunes. Hops appear as an indistinct, spicy bitterness. Slightly sweet finish. Flavors don't have a lot of depth. F - Medium to heavy body seems appropriate. Low but slightly creamy carbonation. Medium hops bitterness cuts the malt sweetness. Moderate alcohol presence doesn't seem objectionably hot. O - This is a good barleywine, but doesn't have the depth and complexity of flavors and aromas of the best examples I've had. Revealing my old school ness, allow me to say this is one of my favorite non barrel aged barleywines out there. Back in the 90s, there weren't a lot of options, but Pike was one of the ballers in the game. Pours a dark burnt orange and auburn kind of color with a full inch of head that sticks around and has retention for days. Aroma hits a lot of malt sweetness and caramel feels. Taste is a blast of hops just underneath Fresh Bigfoot. The mouthfeel has a warming presence from the alcohol, but no bitter sting that you might expect with this much hops and alcohol. The hops give off the old school pine and grapefruit combo, a little bit of caramel with the ever so slightest drop of vanilla at the end. This isn't going to knock anyone's socks off in this day and age, but man, back in the day, this was one of the best scores you could make. I've never drank this aged, but I have a 10 year old bottle I would like to check out here soon. Will update score then. The appearance was a mostly dark ruby red to cloudy brown color yet with a subtle transparency about it. But when held up to the light, not much carbonation could be seen rising. Just a film of a little white foamy head sat atop but slid off at a mild pace. The aroma had some dark to pomme-like fruits glossing over some brown sugar, faint dried tobacco, sweet citrus, light grassiness and some cocoa powder at the very end. The flavor was mildly sweet with slight bitterness trying to stiffen up the undercut of the sweetness. Tobacco/grassiness seemed a bit more blended yet also a touch fainter than in the aroma along with the cocoa powder and brown sugar. Aftertaste seemed more of the dark and pomme-fruits. The mouthfeel was about medium bodied with a fair sipping quality about it as the carbonation felt fine and nothing really seemed to obstruct the sips in terms of a steady balancing ABV to the overall feel. Some dryness along my tongue but not overly gripping. Overall, pretty nicely done American styled Barleywine, fans of SN's Bigfoot and Rock Art's Vermonster should like this one. Good, but not great for its style. Look: It pours cloudy medium brown with a tinge of orange and a light brown head. Smell: The aroma has plenty of sweet malt with bread and caramel. It also has aroma of plums and floral elements. It also has hints of citrus that is orange like. Taste: The malt is predominant with a balance between the esters and hops in the background. The malt flavors are sweet with the hop balance being somewhat aggressive with a moderate alcohol element in the taste. It has bread and caramel malt richness in the flavors with floral hops and citrus that in orange like. There are also hints of plums and the alcohol does has a hint of whiskey element in it as well. Feel: It has a chewy body with moderately high alcohol warming that is a slight tinge hot, but not unpleasant. It is somewhat dry and the floral hops and dryness linger on the palate. Overall, this is a malt forward barley wine that is moderately hop aggressive as the beer warms. Cloudy dark copper colored, white head. Aroma of boozy caramel and earthy hops. Taste is fairly bitter, drier finish. Sticky mouth feel. Nice barley wine color, deep brown, slightly murky with a ring of tan head. The aroma is good, mostly sweet but lacking in any depth. Same for the taste. It's good but pretty one-dimensional. 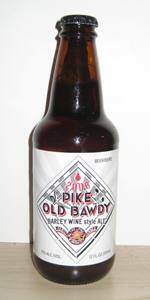 Medium-bodied with a persistent carbonated tingle. On tap at the Pike brewpub, Pike Place. A: An opaque orange/amber with half finger off-white head that dissipated quickly. S: Caramel malts, dark fruits, pine resin and a bit of vanilla on the finish. T: A sweet opening with caramel and toffee followed by dark fruits. Then a light piney-ness follows with some booze and vanilla on the finish. M: Medium with medium, dry carbonation. O: Not as hoppy as most American Barleywines, and that's OK by me. A slow sipper with lots of flavor enhancing as it warms.